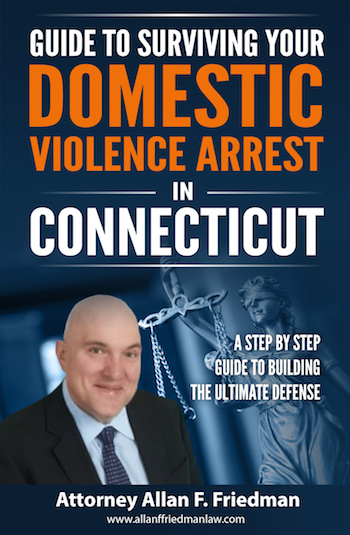 The standard procedure in any domestic violence arrest in Connecticut is that the Court will enter criminal orders of protection in favor of the alleged victim at the time of your arraignment. Top Stamford domestic violence defense attorneys will advise you that in domestic violence cases the arraignment must take place by law the next business morning that the Court is open. The reality is that due to the rapid unfolding of events in a domestic violence arrest more often than not clients do not have an opportunity to retain an attorney to represent then at the arraignment the next day at Court. This is really regrettable as many decisions are going to be made which will have a significant and lasting effect on your life that day and having an experienced Stamford domestic violence defense attorney by your side can often make a significant difference in the outcome. Due to the short period of time between the arrest and the time that people are released from the Police custody, and the logistical problems they are often facing needing to find a place to stay for the night, they often can’t find the time to meet with and retain an attorney. Every week I have people coming into my office who have already appeared at domestic violence arraignments and who have been issued criminal orders of protection often preventing them from returning to their home or contacting their children. While it would have been better for them to have had a lawyer with them during the arraignment it is not too late to take action to file motions with the Court seeking a modification of the terms of the criminal orders of protection. While it is certainly much harder to convince a Court to modify an order that has already been issued I have a very good track record of getting these orders modified. The most important ingredients of any successful motion to modify a criminal order of protection in our local Courts are #1 that the victim is in agreement with the proposed change and #2 that you the accused can demonstrate to the Court that you have engaged in some course of therapy or treatment which addresses the underlying issues which lead to the original incident. These kind of motions can lead to your moving back into your home with your spouse or significant other and children. If you would like to have a free consultation to review the options for having your criminal orders of protection modified contact a Stamford domestic violence criminal attorney today. Believe it or not the Victim have little say about what kind of protective order the Court will issue. I have worked on dozens of cases where the victim has gone down to the Court the day following a domestic violence arrest and met with the family relations office and told them in no uncertain terms that they did NOT want the accused to be removed from the home and that they did not need any protection from the accused. Sadly, the family relations officers are trained to discount the input of domestic violence victims who they are trained to believe in many cases are emotionally traumatized by their attackers. For this reason the family relations officers often disregard the wishes of the victim and base their recommendations upon a scoring system known as a risk assessment analysis. The victim is not allowed to speak during the arraignment about the victim’s wishes. In practice in our local Courts the office of family relations has already previously filled out the order of protection based upon its review of the Police report and interview with the parties and the Court in 99% of cases is going to just sign that order as it stands and read it to you and that order will remain in effect until your case is concluded or until you file to modify it. Just because the family relations officer ignored the victim’s input in generating the original order does not mean that all is lost. The fact that the victim is against the order and wants to have it modified will be very persuasive and assist us in having your criminal order of protection modified. When the time comes for your hearing on our motion to modify the conditions of release we will call upon the victim to come up and address the Court and let the Court know how they feel about the order of protection and what their desires are. This is very persuasive argument to convince a Court to modify the order. Obviously the types of criminal orders of protection which clients usually seek to modify are the most restrictive types of orders. The residential stay away which prevents the accused from returning home to the family home can have a significant and lasting detrimental impact not just on the financial wellbeing of the accused who has to find a new place to live for the next several months but also for the family. If young children are involved there can be a significant psychological impact upon the children due to the sudden immediate disruption in their living arrangements and structure of the family unit. This kind of sudden traumatic change in the family unit can have lasting psychological and developmental impacts upon children. The full no contact order which forbids any contact what so ever between the victim and the accused is often draconian and overly severe. These kind of severe orders may have their place in situations – for example – where the accused is alleged to have severely beaten the victim and poses a threat of serve physical danger. However, we regularly see these kind of extreme criminal protective orders put in place where no violence or physical contact has occurred. Often all that has transpired is a shouting match or yelling between a couple and possibly the breaking of something like a plate or a dish and the Court will impose these serve and harsh criminal orders of protection which have significant impacts upon both thee accused and the victim and the rest of the family unit. If you are facing this kind of situation contact a Stamford domestic violence criminal attorney to review your options to have the criminal orders of protection modified. For those who were prudent enough to bring a Stamford domestic violence defense attorney with them to their domestic violence arraignment you can (only at the arraignment hearing) request a Fernando A. hearing which is a an evidentiary hearing before a Judge of the Superior Court to contest the issuance of the order of protection. These hearings must take place within a reasonably quick period of time – in some cases in as little as two weeks. However, unless you or your lawyer specifically requested a Fernando A. hearing during the arraignment itself then you have deemed to have waived your right to such a hearing. What If the Victim Asks Me to Return Home? Can I Modify the Order Without Going Back to Court? Absolutely NOT. No one can modify of alter the conditions of the criminal order of protection expect for thee Court itself. The order will stay in full force and effect until the case is concluded which usually takes at least a few months or until the Court agrees to modify the order and issues a new one. I have seen many situations where couples have reconciled on their own and basically ignored the provisions of the Court’s criminal order of protection. However, this kind of behavior is very risky as if for any reason you get caught you will face a felony charge of violation of a criminal order of protection which exposes you to up to 10 years in prison. An additional reason why this is a really bad idea is that people who are going through domestic violence problems often are dealing with some underlying issues in their relationship which were the cause of the arrest in the first place. If for any reason these problems come to the surface again while you are in the home in violation of a criminal order of protection and the Police are called then you are going to face an automatic arrest for violation of the order of protection regardless of the wishes or desires of the victim. Can the Domestic Violence Order of Protection Be Modified While My Case Is Still Pending? - How Does This Work? At any time your lawyer can file a motion to modify the criminal orders of protection that are in place in your domestic violence case. However, getting such a motion granted takes a little bit of effort and planning. Generally once the orders are in effect Courts are reluctant to modify them out of fear that the accused may attack the victim. Bearing in mind that Courts are very reluctant to modify criminal orders of protection you will need to be prepared to present a compelling case to the Court why it should do so in your case. This is why it is important when seeking to modify the criminal orders of protection that you work with an experienced Stamford domestic violence criminal attorney. The Court will not allow you to make an oral motion at your court date to modify a criminal order of protection. The motion must be made in writing and it must be filed well in advance of your next Court hearing date. Different jurisdictions handle these motions differently. Stamford for example will hear the motion to modify the criminal order of protection at your next domestic violence court date. Some other courts will assign these types of motions to a specific motion “calendar day.” Whichever is used, it is important to file the motion early so that all the parties involved (prosecutor – family relations officer and victims advocate) all have notice of the motion itself and have ample opportunity to contact the victim to get the victim’s input and conduct their own investigation to determine what their position will be on your motion. Usually in order to prevail with a motion to modify the Court is going to want to see that no new arrests or problems have arisen since the date of the original arrest. Also, most Judges will want to see that the accused is in some form of anger management or substance abuse therapy or treatment either through Court ordered AIC or with a private therapist. Having positive reports from these treatment providers in a crucial part of getting a motion to modify granted. Finally, having the victim present in Court to testify and tell the Judge that they want the order modified is always the best and most persuasive argument that can be made to support an effective motion to modify a criminal order of protection. With so much at stake it is worth it to spend some time preparing to present an effective argument to the Court to modify the criminal orders of protection. While attending therapy sessions and treatment may not be on your top 10 list of most enjoyable activities these reports will help greatly to get your criminal orders of protection modified and also they will be of great assistance in achieving a favorable outcome of your domestic violence case. Your first step in every situation where you would like to modify the terms of a criminal order of protection matter is to visit us for a free consultation to discuss the facts of your case. From there we can build the best plan to defend your case and modify the terms of the order of protection. Contact a Domestic Violence Criminal Defense Attorney at the Law Offices of Allan F. Friedman Today! We provide free initial consultations. We have 25 years of experience defending domestic violence allegations throughout the State of Connecticut. Working with an experienced Stamford domestic violence defense lawyer can make the difference in having your motion to modify your criminal order of protection modified. If you would like to have your criminal order of protection modified and you were arrested for Domestic Violence in Norwalk, New Canaan , Fairfield, Greenwich, Stamford, , Darien, Cos Cob, Westport, Wilton, Weston, Bridgeport and throughout the County of Fairfield do not hesitate to contact the Law Offices of Allan F. Friedman. Our rates are reasonable and we offer payments plans as needed. Call Attorney Friedman at 203.515.4110 to schedule your free initial consultation we are available 24/7. Or you can contact us online for a prompt response.